Dairy Kingdom supplies high-quality milk proteins for industrial uses. Definition: Milk powder is milk that has been turned into a dry substance by evaporating its water content. This increases its shelf life and results in a product that is extremely suitable for use in the food and beverage industry. The powder is mainly available in two varieties: skimmed milk powder and whole milk powder. 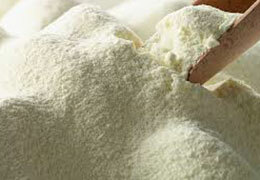 Whole milk powder is made by evaporating full cream milk as it is. Skimmed milk powder is made by evaporating milk that has had the cream skimmed off. Below you will find our standard product specifications. We will also be happy to supply you with dairy commodities that meet your individual requirements. Dairy Kingdom is a leading international trading company specialized in the trade of dairy commodities for industrial use.